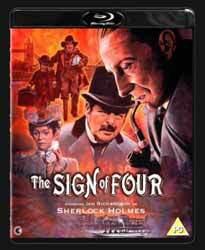 The Sign of Four is a 1983 UK TV movie featuring Sir Arthur Conan Doyle's famous detective Sherlock Holmes. This was originally destined to be the first of six Holmes movies, but Granada TV's series starring Jeremy Brett put paid to any more than two being made. This is somewhat of a shame, because Ian Richardson turns in one of the best portrayals of Holmes to have been committed to film. And while I do like Brett in the role, his take on the character takes some time to warm to. While Richardson is this productions one saving grace, there's not a lot else going for it. The plot is stretched to breaking point and a more modern audience may have some trouble staying awake for the duration. As I mentioned previously, it's a pretty ambling affair. The story moves at a snail's pace and just drags on and on. The only high points being Richardson's incredible performance as Holmes. This is probably not surprising, given Richardson's acting background and the fact that he read every story containing Holmes to get a feel for the character. For extras we get an interesting audio commentary with renowned ‘Holmes’ expert David Stuart Davies. He repeats some of the information on The Hound of the Baskervilles, but it's only information that's important about the background of the series. This is an interesting listen, as Davies tells us many interesting facts about the actors, the deviations from the original book, and general background information. The fact that half the picture appears to be missing would prompt me to recommend this on DVD only - but to be perfectly honest I wouldn't really recommend it if, like me, you're one of those people who will be annoyed by this rather strange production choice.